Jim Carrey stars in new dramedy Kidding, there's the An Post Irish Book Awards, and a documentary about posh London hotel , the Corinthia . . . 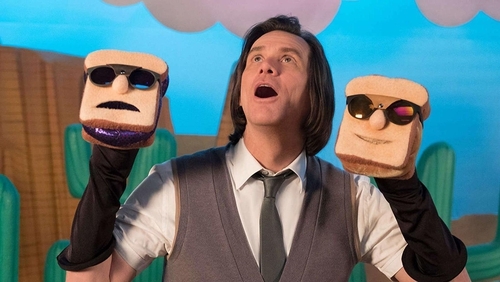 In his first serialised role in over two decades, and his first collaboration with director Michel Gondry since Eternal Sunshine of the Spotless Mind, Jim Carrey stars in a poignant drama as children’s TV entertainer Mr Pickles. Mr Pickles is an American icon, a beacon of kindness and wisdom to countless impressionable young minds, and also the anchor of a multimillion-dollar branding empire. But when tragedy strikes and his family begins to implode, he finds no fairy tale, fable or puppet will guide him through the crisis, which advances faster than his means to cope. Presented by Keelin Shanley, the awards' shortlist features new and established writers across sixteen categories, including Novel of the Year, Children’s, Cookery, Crime Fiction, Popular Fiction, Sports, Poetry, and the new ‘Love Leabhar Gaeilge Irish Language Book Of The Year’ category. Thomas Kochs, formerly general manager of Claridge's and star of the award-winning documentary series Inside Claridge's, is at the helm of a new, modern five-star hotel in London. Only seven years old, Corinthia is situated just off London's Trafalgar Square. It faces competition from London's many other five-star hotels which also woo the superrich looking for the ultimate luxury stay in London. The festive season starts here, as Kirstie Allsopp shares everything she loves about Christmas. She meets natural beauty experts making luxurious presents using ingredients you can find in the kitchen; the art of the pop-up Christmas card; the secrets to the best festive windows; sparkle magic wands; and the creative possibilities of plaster of Paris. This final episode features Sophie Lott, a former probation officer who's now at the Foreign Office’s specialist Forced Marriage Unit. Her latest case involves a 17 year-old girl who was orphaned in Britain and sent to live with relatives in Iraq. As the girl approaches her 18th birthday, Sophie has discovered that her family in Baghdad will kill her if she doesn’t agree to marry. In the penultimate episode of Julia Davis's latest cringe-fest, it’s the annual weekend work outing for Sally, providing a chance to take a welcome break from Emma’s shenanigans. She and the team are sent to a hotel, where it becomes clear Sally and co-worker Nigel (Julian Barratt) have developed real feelings for each other. As the drinks start flowing later, Sally finds herself pounced on by yet another admirer, and a rogue fire alarm leads to a surprising revelation.